For as long as I can remember, coffee has been a part of my life. I come from a family that had a pot of coffee brewing in the morning, again at lunch and after dinner. Then there was the ” let me make a fresh pot” if company came over. I lived with my grandparents and my grandmother was always cooking or baking. Her day revolved around meal planning and coffee was always part of the experience. It was part of our social rapport with people and I saw it as a way we welcomed them into our home. I assumed it was completely normal until I met people that did not drink coffee. Gasp! Yes, I know people drink other beverages. I am from the south and we drink tea so sweet that it rivals the sugar buzz kids get after Halloween. It is just a part of the culture. I am one of those odd ones that can’t tolerate the sweet tea (especially in the summer heat), so as an adult I’ve kept with the coffee tradition and embrace it wholeheartedly. In the early 1990’s I was visiting Tempe, Arizona and found a coffee house close to campus. It was a first for me. Coffee, pastries, sandwiches. Not a restaurant really, but a place focused mainly on the coffee. Everything else was an accompaniment. I was in heaven. People chatting, reading, studying (college town) and sitting on the patio immersed in conversation, relaxing with coffee as their common thread. I had not seen such a place in my town and I loved the outdoor seating with the misters providing relief from the heat. I know it seems odd, but remember coffee was a part of our social life at home or in other people’s homes, not something we went out for. I left there wanting to open a coffee shop of my own. Not following up on that idea is probably one of the things I will forever regret. Ah well. Not long after that, coffee shops started gaining in popularity (at least in my part of the country). Starbucks, which had been founded in 1971 in Seattle, had been expanding but it wasn’t until the 1990’s that it really started gaining in popularity. (http://en.wikipedia.org/wiki/Starbucks) Now there are coffee shops all over the country and many other chains as well as locally owned coffee houses that roast their own special blends. Having always had coffee, I never really thought about where it came from or when it became popular. I decided to do some research. European travellers to the Near East brought back stories of the unusual dark black beverage. By the 17th century, coffee had made its way to Europe and was becoming popular across the continent. Opponents were overly cautious, calling the beverage the ‘bitter invention of Satan.’ With the coming of coffee to Venice in 1615, the local clergy condemned it. The controversy was so great that Pope Clement VIII was asked to intervene. Before making a decision however, he decided to taste the beverage for himself. He found the drink so satisfying that he gave it Papal approval. Next on my web search was a lovely site called The History Kitchen on the PBS (Public Broadcasting System) website. They have a particular piece on coffee titled: The Caffeinated History of Coffee by Tori Avey This site is visually attractive and filled with interesting coffee facts and lore. 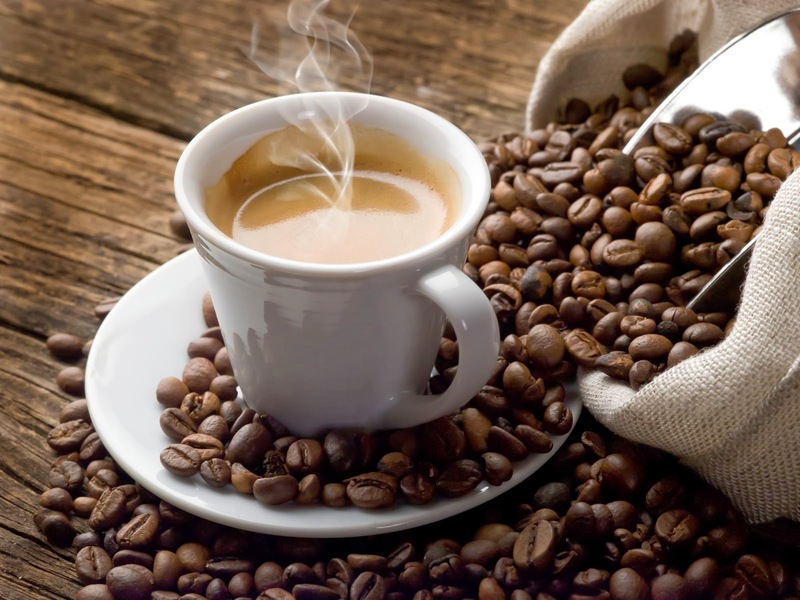 Coffee plants reached the New World during the early 18th century, though the drink wasn’t really popular in America until the Boston Tea Party of 1773, when making the switch from tea to coffee became something of a patriotic duty. The Civil War and other conflicts that followed also helped to increase coffee consumption, as soldiers relied on the caffeine for a boost of energy. It may have started a bit later here, but Americans love coffee just as much as the rest of the world. Teddy Roosevelt himself is counted among America’s great coffee drinkers due to his rumored consumption of a gallon of coffee daily! Roosevelt is also said to have coined Maxwell House’s famous “Good to the Last Drop” slogan after being served the coffee at Andrew Jackson’s historical home, the Hermitage, in Tennessee. Lastly, in The History Kitchen article there are recipes. I feel I have come full circle at this point with my quest for a bit of coffee history. Back to the memories I associate with this delightful beverage. Thoughts of my grandmother, the gathering of friends, the sharing of food and pleasant conversation, all around a steaming cup of coffee. I hope you found something fun or interesting here.